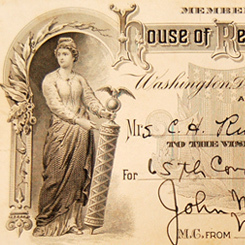 About this object Issued in 1918, this pass signed by Montana Congressman John McEvans, granted admission to the House Gallery. On this date, the House public galleries were closed due to the severity of the Spanish influenza pandemic. According to some modern estimates, more than 50 million persons perished worldwide in the 1918–1919 outbreak; most sources attribute approximately 675,000 deaths in the U.S. alone to the Spanish flu. Washington, D.C., swollen by an influx of government workers during the First World War, was particularly hard hit. Medical facilities were stretched beyond capacity. Four hundred deaths were reported in the District of Columbia during the second week of October; 730 were reported the following week. During an abbreviated session on October 7, with many Members absent because of sickness, Henry T. Rainey of Illinois addressed the House on the necessity of closing the galleries, where large crowds often were closely confined, to prevent the spread of the disease. “Mr. Speaker, it is matter of common knowledge that an epidemic of alarming proportions is prevailing throughout the country,” Rainey said. “Out of an abundant precaution the Senate has ordered the galleries closed, which action, I understand, meets with the approval of the medical authorities, and so I ask unanimous consent that the Speaker be instructed to close the galleries of this House until further action shall be taken by the House.” The motion was approved without objection. The House did not stop operating at the peak of the flu outbreak during October, but its schedule was affected. Until the middle of the month, it usually stood in recess punctuated by brief pro forma sessions that often lacked quorums necessary to conduct business. The closure of the public galleries while the House met was exceedingly unusual—as was the length of the closure. The House and Senate galleries did not reopen until November 4, after the flu had largely run its course in the capital.